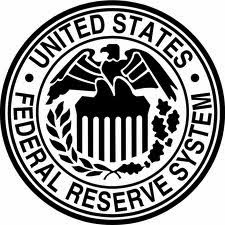 The Federal Reserve Board has been doing some arm twisting with U.S. financial services companies to adjust their executive compensation plans - and those plans are in fact being modified to cap bonuses associated with achieving performance goals. These actions have their genesis in the financial crisis where it appeared that incentives could encourage excessive risk taking by management. A Wall Street Journal article* notes “regulators are still looking at ways to lower risk in the banking system, even if it means interfering with private pay practices.” This follows a similar trend in Europe and where some firms are considering increasing salaries to make up for less bonus potential. These actions merit some thoughtful consideration within the U.S. nuclear industry. While the Fed’s concern is excessive business risk, the analog in nuclear operations is safety risk. Both go to ensuring that the “system” (banking or nuclear production) remain within controlled limits. As we have noted in prior blog posts (July 6 and July 9, 2010), there have been trends for nuclear executive compensation to both escalate and include significant performance based components. The increased salaries probably reflect competition for the best qualified executives and are indicative of the great responsibilities of nuclear management. However the trend to include large short-term bonuses (comprising up to 60-70% of total compensation) may be indicative of the evolution of “nuclear generation as a business” and the large profit potential available at high capacity factors. Whatever the nominal amount of pressure on nuclear executives to achieve operating goals, the presence of very large monetary incentives can only increase that pressure. In a strong safety culture environment where perception of management’s priorities is central, incentive based compensation plans can easily create presumptions regarding the motivation for management decisions. At least one nuclear utility has concluded that incentives were not appropriate and taken action to adjust their compensation plans. We have advocated dialing back incentives in favor of more direct compensation. It is also rather interesting that the Fed decided to step into the province of private compensation practices. A similar initiative by the NRC seems unlikely given its reluctance to impinge on management performance in any manner. As noted in our February 28, 2013 post the NRC has included some nominal but poorly focused language on incentives in its Safety Culture Common Language Path Forward. This seems to indicate that the NRC believes incentives are or could be relevant. The best approach may be for the NRC to become more intrusive - to determine if compensation plans have the potential to lead to excessive risk taking. This would require the NRC to obtain compensation plan information from its licensees, characterize the extent and magnitude of performance based incentives, and consider the effect of such incentives in assessing specific operational issues that arise in its normal regulatory oversight activities. Only if some relationship appeared would the NRC need to consider whether to take action similar to the Fed or other means to ameliorate risk taking. * A.Lucchetti and J. Steinberg, "Regulators Get Banks to Rein In Bonus Pay," Wall Street Journal (April 23, 2013). The International Atomic Energy Agency (IAEA) has a 2012 publication* that provides guidance on establishing a strong safety culture (SC) during the design and construction of new nuclear power plants. The report's premise, with which we agree, is a weak SC during plant design and construction can lead to later problems during plant operations. Major issues can arise during plant design and construction. For example, the numerous organizations involved may have limited direct experience and/or insufficient knowledge of nuclear safety requirements, or projects may be located in countries with no existing nuclear industry or countries may have a nuclear industry but no recent construction experience. The report attempts to cover the different needs, challenges and circumstances that may face project participants (governments, regulators, owners, designers, builders, manufacturers, etc.) anywhere in the world. Most of the content addresses generic issues, e.g., understanding SC, the role of leadership, appropriate management systems, or communication and organizational learning. Each issue is discussed in terms of specific challenges, goals, and recommended approaches and methods. However, in their effort to attain maximum coverage (scope) IAEA sacrifices depth. For example, the discussion of leadership covers five pages of the report but scarcely mentions the two most important activities of leaders: decision making and modeling safety-focused behavior. If we look at the report's specific advice and recommendations, we see uneven coverage of the observable artifacts we consider essential for a strong SC: a decision making process that appropriately values safety, an effective corrective action program and financial incentives that reward safety performance. That's a good starting point but what are the characteristics of an appropriate decision making process? It seems that decision making should be “conservative” (pp. 32, 34, 39), “broad” (p. 43) and “risk informed” (pp. 50, 51) but the terms are not defined. More specificity on how the decision making process should handle competing goals, set priorities and assign resources would be useful. What about the decision makers? Leaders should be able to “Explain the relationships between time periods/horizons and decision making to help resolve competing priorities.” (p. 41) That's OK but the need goes beyond time periods. The manager must be able to explain the rationale for significant decisions related to safety. What were the considerations, assumptions, priorities, alternatives, decision factors and their relative weights, and the applicable laws, rules and regulations? How should leaders treat devil’s advocates who raise concerns about possible unfavorable outcomes? Do leaders get the most qualified people involved in key decisions? In addition, leaders should “Simulate decision making in a fast paced, complex environment to help leaders identify risks in their own approaches.” (p. 41) This is an excellent approach and we wholeheartedly support it. “Ineffective problem identification, inadequate reporting and inadequate corrective actions” (p. 9) were identified in a 2006 investigation as causal factors of construction problems at a nuclear plant site. But there is no follow-up to describe the characteristics of an effective corrective action program. There should be more about the CAP's ability to recognize and diagnose problems, formulate and implement solutions that consistently and appropriately consider safety, and monitor the effects of corrective actions. The importance of robust cause analysis, i.e., analysis that finds the real causes of problems so they do not recur, should be mentioned. This would not be an unreasonable level of detail for this general report. The report correctly notes that “In construction environments, cultural attributes such as schedule awareness, cost focus and urgency of problem resolution are reinforced because they are rewarded by immediate measures of success.” (p. 8) This becomes a specific challenge when “Contractor incentives are often driven by cost and schedule rather than by safety culture performance.” (p. 26). A recommended fix is to “Establish a reward and incentive programme [sic] for the overall project, with objectives for safety performance and rewards that are either monetary or in the form of future contracts as a long term partner.” (p. 27). This will probably result in a focus on industrial safety performance rather than the overall SC but it may be the best practical solution. Periodic assessment of key contractors' SC should be used to identify any general SC issues. In prior posts, we have taken the IAEA to task for their overly bureaucratic approach. So we're pleased to report this document actually provides some useful, sensible guidance (albeit often in an unprioritized, laundry list style) applicable to both countries initially embarking on the nuclear road and more experienced countries experiencing a nuclear renaissance. The report makes a few important points. For example, IAEA proposes a systems approach to thinking about all the project participants and the varied work they must accomplish. “In the case of NPP projects, the ‘system’ involves human–social systems, work processes, complex technologies and multiple organizations in a global economic, energy, environmental and regulatory context.” (p. 11) This is a viewpoint we have repeatedly advocated in this blog. Overall this report is satisfactory and it does refer the reader to other IAEA publications for additional information on specific subjects. But in trying to provide relevant material to a plethora of stakeholders, the report gives shorter shrift to factors we consider vital to establishing and maintaining a strong SC. 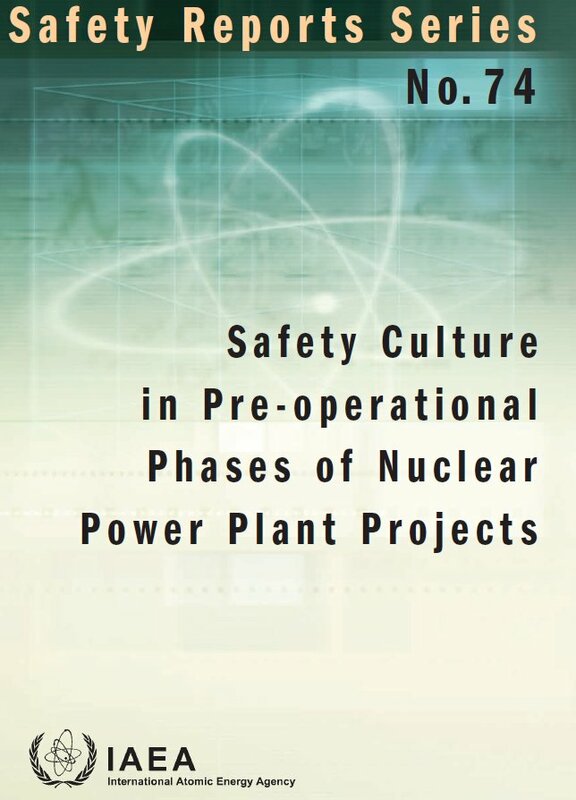 * M. Haage (IAEA), “Safety culture in pre-operational phases of nuclear power plant projects” (Vienna : International Atomic Energy Agency, 2012). Originally published 4-4-13. This version updated with data from the associated staff briefing slide presentation. 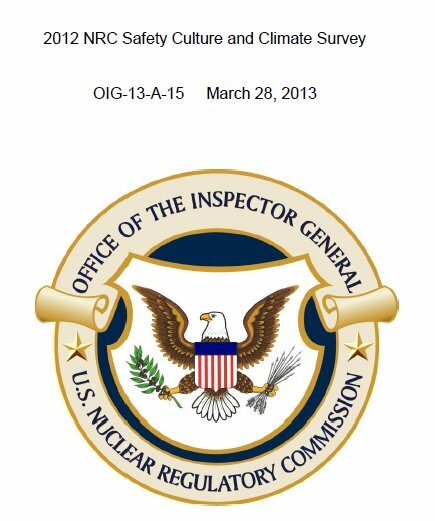 The 2012 NRC Safety Culture and Climate Survey results are available in an Inspector General report* and a consultants' slide briefing. ** The top-level findings are (1) the 2012 results are not as favorable as the previous 2009 survey results and (2) the NRC compares favorably with national norms but lags when compared to a group of high performing companies (with strong financial results and high employee survey scores). Let's look at some of the details. All page references are to the report except where noted otherwise. The survey's 132 items were aimed at evaluating employee perceptions in 20 categories. Many of these categories primarily addressed personnel practices—communication, supervision, diversity, training, development and the like. However, it should come as no surprise to our regular readers that the categories of interest to us address, at least in part, the key business processes of decision making, priority setting and conflict resolution, i.e., areas where the goal of safety often competes with other goals. Senior Management: “. . . confidence in management’s decisions.” Compared with the high performing companies, the NRC scored 7 points lower on Senior Management, in a 3-way tie for second lowest. (p. 17) This result may have been affected by this item: Only 41 percent of the respondents “. 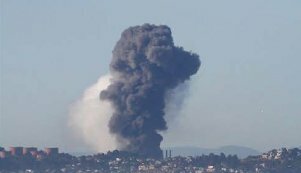 . . feel significant actions have been taken as a result of the previous Safety Culture and Climate survey.” (Slides, p. 23) This issue was included in the list of conclusions to the consultants' report. On the other hand, at least 75% favorable responses were recorded for senior management providing a clear sense of direction and employee confidence in senior management decisions. (Slides, p. 23) That may look good but both items scored significantly lower than in 2009 and compared to the high performing companies. The report consists of mostly charts and graphs, with a lot of superficial data slicing and dicing and some authoritative-sounding conclusions. The slide presentation shows additional data to illustrate some problem areas. Both documents reinforce our belief in the limited usefulness of surveys and the problems associated with over-reliance on outside experts. My “analysis” above is obviously limited but it's difficult to dig deeply because only a few of the 132 specific items are detailed in the report and slides. But the available data suggest that raising views inconsistent with the party line can lead to negative reactions. NRC employees have some confidence the agency makes decisions consistent with its mission but less confidence in their senior management to take action on survey results. NRC senior management has a much more favorable view of the agency's situation than the overall organization. Senior managers' survey responses were significantly more favorable than the overall NRC response in ALL 20 categories and an average of 18 percent more favorable in the 4 categories included in this post. (Slides, p. 37) This suggests a possible disconnect between the bosses and everyone else. And speaking of disconnections, it appears neither the group responsible for the Nuclear Renaissance nor Region IV is fully on the same page as the rest of the agency. Finally, the documents' omission of safety as a goal or priority is notable. “Nuclear safety” as a goal is only mentioned in the definition of SC. Safety is mentioned as “safety concepts” in the Training category and the “NRC’s commitment to public safety” in the Continuous Improvement Commitment category. One might expect safety to be more front and center in the SC survey. 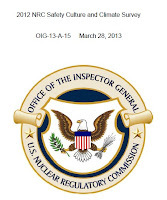 * NRC Office of the Inspector General, “2012 NRC Safety Culture and Climate Survey,” OIG-13-A-15 (March 28, 2013) ADAMS ML13087A326. Although this was mostly a survey, the consultants (Towers Watson) did conduct some individual interviews and focus groups to help shape the survey content. Interestingly, the definition of safety culture used in the 2012 survey was not the same as the definition in the current NRC policy statement. Instead, an earlier definition was used to permit comparisons between current survey results and prior years. ** Towers Watson, “Nuclear Regulatory Commission 2012 Safety Culture and Climate Survey Briefing for NRC Staff” (Nov. 8, 2012). *** “Significant” means statistically significant.